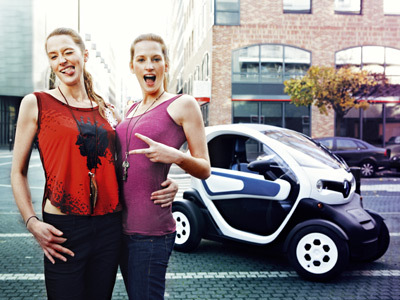 Twizy confirms Renault’s reputation as an innovative carmaker. Quite simply, Twizy is one of a kind – a simple and effective idea with a choice of two engines, three trim levels and a reduced number of options. Check it out in this video! 2 engines, depending on use and homologation. 4 kW/5 hp and top speed limited at 45 kph for Twizy 45; the driving-permit version reaches 80 kph. 3 trim levels: Urban, for maximum safety and comfort from the first trim level; Color, for more design and colorful harmony; and Technic, with two-tone metallic paint as standard, plus alloy wheels. useful options (doors, comfort pack for Twizy 45) and plenty of accessories (reversing radar, rear-seat storage, MP3/phone kit). and all the advantages of battery rental linked to planned vehicle use in terms of mileage and time period (12 to 72 months, 7,500 to 15,000 km a year, insurance for all types of breakdown included, with a 24/7 towing service in a radius of 80 km from the customer’s charging point).